When I speak about rice cakes to family & friends back home, they think of the crispy snacks... but this is what it looks like in Korea. My favourite is the ones filled with honey, nuts & sesame seeds. 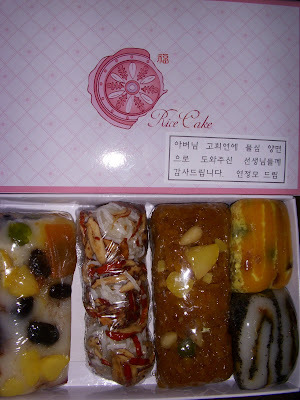 Rice cakes (tteok) is a popular gift to give for special occasions. One of the 4th grade teacher's at my school had a family celebration recently. I'm still not sure who it was (one of his parents or in-laws). Anyways, somebody celebrated their 70th birthday. One's 70th birthday is a milestone in Korea. It used to be 60, because before people used to only live to the age of 60. Anyways, the teacher at my school distributed boxes of rice cakes to every single teacher and it was presented in a gift bag! To give you a rough idea of how many teachers there are... Grade 1 - 6 (and there are about 10 staff members in each grade).